Minister for Agriculture Jaala Pulford and fishing icon Rex Hunt visited Alexandra Lake in Ararat on Wednesday to promote the 2018 VicFish Kids Program. Caption: Media personality Rex Hunt tries a spot of fishing at Alexandra Lake. 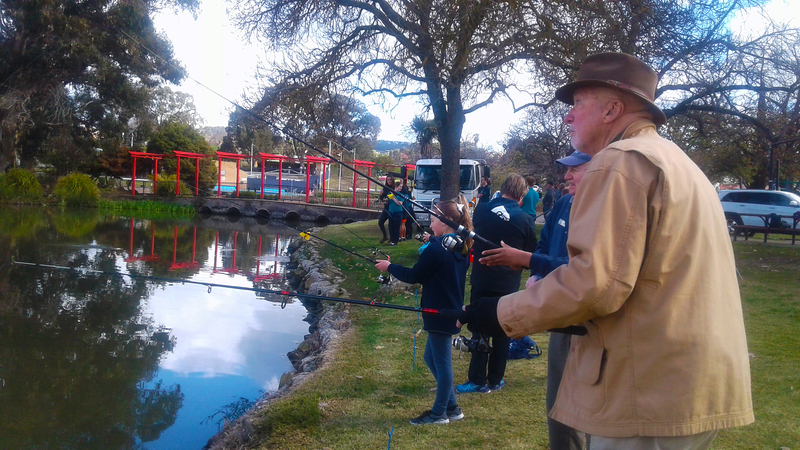 The free fishing clinics for kids is an Andrews Labor Government initiative to help get more youngsters into Victoria’s great outdoors and try their luck at reeling in a catch of the day. Ararat has been announced as a location for one of the five clinics to be held in September and October. VicFishKids events are fun and everything is provided so kids can learn to cast, tie knots and understand what to do when they catch a fish. “Our Target One Million plan is about getting more people fishing, more often – that’s exactly what these events will do,” Minister for Agriculture, Jaala Pulford said. “These events will help kids try the popular pastime in a safe environment and with expert help from Fishcare and angling club volunteers. There will be 200 rod and reel outfits given away at each event to encourage beginners to stick with the hobby and try it again another time. VicFishKids events boast activities for all the family, including trout being released on the day with help from the kids and a photo booth to immortalise that fish of a lifetime. For more information, visit vfa.vic.gov.au/vicfishkids.